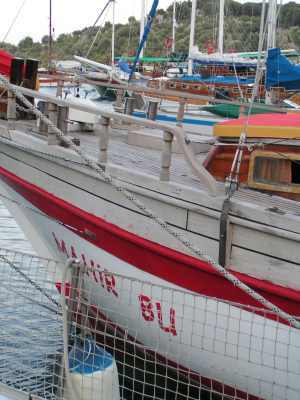 Shortly after leaving the protection of the Bay of Fethiye, the wind increased and changed direction to "On the Nose". We decided to turn and spend the night in a sheltered bay rather than motor directly into the waves. Danza had just overtaken us when we took this picture. They decided to keep going. We met again in Marmaris a few days later. 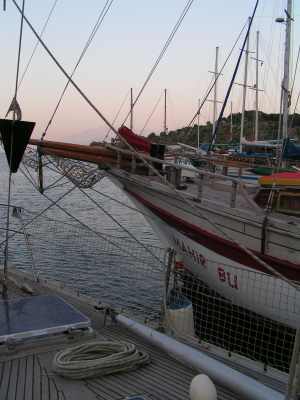 Our hope of a peaceful night followed by an early start the next morning was ruined by this Gulet. It is the duty of the skipper of a vessel to avoid collision, damage etc. We had anchored here, about 15m away from the sailing yacht with the blue stripe and the green Kayak. We were concerned that with gusts we had got as close as 2m from him. I had spoken to the skipper of the American flagged sailboat and assured him that if the wind increased we would take steps to ensure the safety of both vessels by moving our boat. 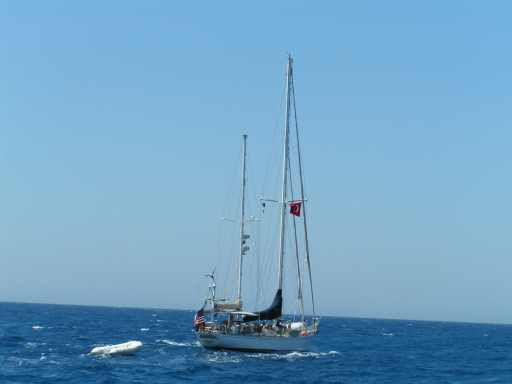 Unbelievably this Gulet came and anchored in the safety space we had left between our two vessels. He was so close that I had to stand on the deck with my foot on his boat to keep us seperated. We clearly could not spend the night like this. So if you will forgive me I need to have a little rant, or to repeat one that I had by email with a friend on 10 July the day after. Here is what I wrote. "More, winters? by that you imply that you actually like it here?!? We have never been so unwelcome anywhere in the world. This country is undoubtedly by a factor of several, the worst place we have ever had the misfortune to visit. We had a bumpy miserable trip to Marmaris last night getting in at 3 am. We were anchored, lines ashore in a lovely little bay called Kizilkuyruk (page 202 in the pilot book) We were next to a US boat called "Still dreaming" and had plenty of chain, although the wind puffs came from different directions, enough to be concerned that we were getting too close (15 ft) to "Still Dreaming" Then a Gulet came in between us!, after fending him off with hands and feet, (Ave distance 4-5 feet) he suggested that we pull up on our anchor (which only leaves you with less chain) Laura suggested that as we had been there for 4 hours, he should re-anchor. His reaction was surprising. He said that he hates all yachtsmen, because we never use enough chain (after his suggestion to reduce mine), that "I live here, you visitor, YOU go!" (quote) I enquired "Go where?" gesticulating at the now full anchorage, his reply was, "Go from this bay, go from this country" So we gathered our ground tackle and while retrieving chain (50m) we saw his crew doing a victory dance on the side deck, punching both fists alternately into the air, and hopping from foot to foot. He immediately moved his shore lines positioning his Gulet in exactly the place we were before. So thats why we did a night passage, leaving at sunset, now we are taking his advice, we will leave this country as fast as we can, stock-up fuel-up and go. We will never return, and we will do our utmost to dissuade every person within our sphere of influence from coming here. Fred, you can have it! This idiot actually said (amongst other things that I could not understand, but amused his crew tremendously) "The less yachts, the more business for me"
I am writing to the minister of tourism, and others. To us, this is the worst cruising season ever. It has cost us a fortune to get here, visas, etc. What a waste of money." The email above was written while still very angry, in the calm of hindsight, all I can say is that it was most unfortunate. The Skipper of the Gulet needs to be educated by the ministry of tourism, however in a country where torture is still generally used as a means of interrogation, I doubt it will receive any priority. Good luck to them with their aspirations of joining the EU.